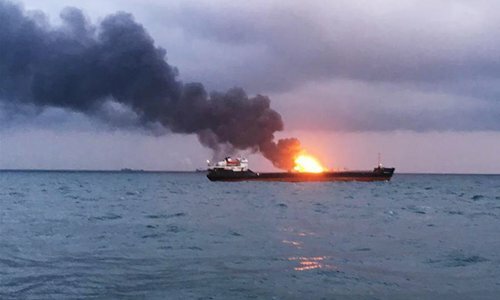 Two ships caught fire after a possible explosion while moving through the Kerch Strait, killing one sailor on board, Russia's Federal Agency of Maritime and River Transport (Rosmorrechflot) said Monday. "According to preliminary information, an explosion occurred on board of one of the vessels. Later on, fire spread to the other ship," a Rosmorrechflot spokesman was quoted by Tass news agency as saying. Rescuers lifted the body of the sailor from one of the burning ships and rescued three others, Sputnik news agency reported. A total of 31 sailors, including Turkish and Indian nationals, were reportedly on board the ships when the accident took place.